England forward Billy Vunipola has been ruled out of the rest of the World Cup with a knee ligament strain. 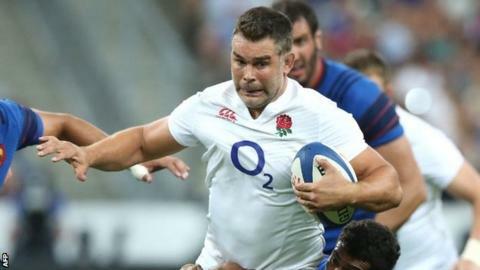 Harlequins number eight Nick Easter, 37, who has 52 Test caps, has been called up as a replacement. Saracens' Vunipola, 22, suffered the injury in Saturday's 28-25 defeat by Wales at Twickenham and is expected to be out for six weeks. Lock Courtney Lawes is a doubt for Saturday's Australia game with a knee injury and will not train on Tuesday. "It's so unfortunate for Billy - he's worked really hard," said England head coach Stuart Lancaster. "He's committed everything to the last three months but he is a young man with a bright future ahead of him and I know he'll be an integral part of this team for years to come. "Nick was unlucky to miss out on final selection. He is a specialist number eight and an experienced player. We know he will make a big contribution." Easter said he was driving to training with Harlequins when he was told he was being called back into the England squad. "The management said I was on standby and that anything can happen," he added. "It's very unfortunate for Billy. He played very well against Wales and was a star of the Six Nations." England have played two games in the World Cup - a 35-11 win over Fiji and Saturday's loss to Wales. They are third in Pool A and face Australia at Twickenham on Saturday and Uruguay a week later, with the top two progressing to the quarter-finals. "The players are looking forward to the biggest week of their lives. It's knockout rugby from here on in," added Easter. Centre Jonathan Joseph, who missed the Wales defeat with a chest injury, is "making very good strides and ticking all the boxes", according to backs coach Andy Farrell. Scrum-half Ben Youngs is "making progress" on a swollen ankle, but will also not train on Tuesday, although number eight Ben Morgan is "fully back" into training.